Weekly Update 2016-12: We listen to some excellent electro-pop by French disco band Paradis, play around with Arduinos and Queens of the Stone Age, and look at how to design a great city flag, thanks to Roman Mars. I don't know where this band has been my whole life. They are the best parts of disco, electronic, r&b, and all sorts of other crazy things all rolled into one musical package. And they are so, so French. There's really nothing like some synthy beats against some smooth saxophone and French lyrics I decidedly cannot understand. Listen and be mystified. I think the whole of last week was an accomplishment in itself. As per ol' calendar of yore, I made three Bunz trades, went to Hebrew lessons (which, by the way, is moving to Thursdays because my teacher wants to move me into the advanced class– what a nerd), went rock climbing twice, attended the Monday jam session at work, met David Walliams, attended a Dribbble meetup and a 7:00AM rave, saw BadBadNotGood from my first-time view in the mezzanine at the Danforth, and wore high heels two days in a row (that's the one I'm most proud of). And if that weren't enough, I (kind of) got the piezo electric disc working! Instead of knocking on a table beside it, I taped it to my speaker so that our good friends Queens Of The Stone Age would help me out with the knocking. In the words of Josh Homme, "sick, sick, sick." In the good way. My goal for this week is to flesh out my journal of Arduino findings into something understandable by people who are not me. 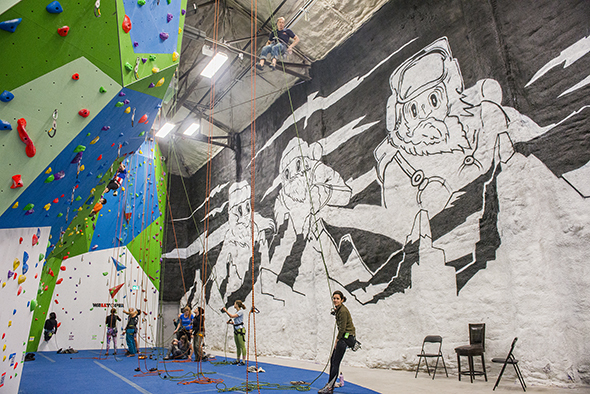 I also want to go rock climbing once more on Saturday (my membership will be up by then but it's only $10 that night for Basecamp's opening party! Woo! And I've really got to practice on the drumkit. Really. After my experience with rock climbing, I have come to some conclusions on the sport. It is really, really expensive. I would love to continue, but for $155 bucks a month plus the cost of shoes and a harness (possibly $200?) it makes for an expensive sport. Honestly I would consider it if I had someone reliable to go with, but I can't expect someone else to pay that, too! It's a lot. In terms of exercise, I am really eager to start up my running again. I want to explore the parts of this neighbourhood that I don't know...sort of south-west of here. Dufferin Grove Park especially. Once that gets boring I may come back to rock climbing to shake things up. Anyway, to the backburner for a while. At least I was seeing myself improve! I got halfway up a slanted wall last time, which I straight up could not do the first time there. Here's a picture of Basecamp, where I do my climbing (and 7AM raving!). I love this mural. I was watching this (increasingly popular) TED talk by the charming Roman Mars the other day. Even as a designer, I've never thought much about city flags. Provincial ones, yes. Like the fact that Quebec is the only province with a good Provincial flag. Except maybe for British Columbia, but that one is a toss-up. After watching this talk, I immediately google searched for a Portland flag patch (which is $5USD plus $35USD shipping to Canada – so...no) and checked out some of the newsletters of the Portland Flag Association. They're a great group! It's so many things to me, all at once. First of all, the colour scheme is excellent. Classic red, white, and blue but somehow decidedly not the American flag. Its got a tiny, subtle version of the Canada flag at the bottom, it's graphically stunning and simple, and it also acts as a simplified version of our (arguably) iconic new city hall buildings. I must admit in the past little while, I have been attending a lot of events at Nathan Philips Square (where the city buildings live), and the city has been trying hard to make it a central social hub. And that is what I see in this flag. I see unity, I see beauty, I see pride. And I see a damn good design.